Microsoft designed Windows 8 around a Microsoft account, which is simply an e-mail address and password. Without a Microsoft account, you can’t install apps, which defeats the purpose of owning a tablet. Although you can log in without a Microsoft account, you’ll definitely want one to make full use of your tablet. After you’ve jumped through a few more hoops, you’re left at the Windows 8 Start screen. Don’t have a Microsoft account? Then choose Sign Up for a New E-Mail address to create one. Don’t want a Microsoft account? 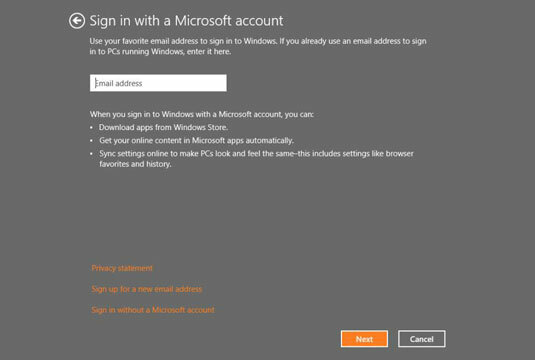 Then choose Sign in Without a Microsoft Account. That lets you create a local account. It lets you use your tablet, but without many of Windows 8’s benefits. You can’t download apps, or use Windows 8’s built-in Mail, People, Messaging, and Calendar apps. Not sure what to do? Create a local account and spend some time poking around your tablet. You can always convert it to a Microsoft account later.